OKB-456 is now known as NPO Energomash, and at the time was run by the brilliant but prickley rocket engine designer, V P Glushko. OKB-670 was run by M M Bondariuk. Bondariuk had been working on nuclear ammonia rockets since 1954. Conventional technology was chosen for the first stage, (the set of boosters), and the YAR (nuclear-chemical missile YakhR-II) for the second, core stage. This was the RN-2. It was also proposed that the core nuclear powered stage could be used as a stand alone ballistic missile for military purposes. (The RN-1) The ground launch of an open core reactor suggests strongly that this would only be used in a nuclear exchange, to me. For both variants, the same basic reactor design was used, with a thrust of 140 tons and a difference only in the exhaust nozzles. For the NR-I the payload / warhead was mounted as in the R-9 missile). The main driver for the development of the YHR-II rocket was to take advantage of the power sources developed for nuclear submarines. These greatly exceeded the power of liquid rocket engines, and could solve space exploration challenges impossible for existing chemical fuel rockets. The boosters also required improved performance, but it was expected that it would be straightforward to build this from existing technology. The dimensions of individual boosters would permit transportation on normal roads. The basic scheme for launching the rocket missile was the same as the launch of the R-7. With the chosen characteristics, the YHR-II rocket provided considerable additional delta-v.
Two different working fluids were considered, Ammonia (OKB-456) or Ammonia and alcohol mixture (OKB-670). The dimensions for both engine variants were assumed to be the same. The NR-2 rocket had a starting weight of 850-880 tons and could carry a cargo of 35-40 tons to an orbital altitude of 300 km. From here, the rocket could be used to transfer cargo to practically unlimited distances. 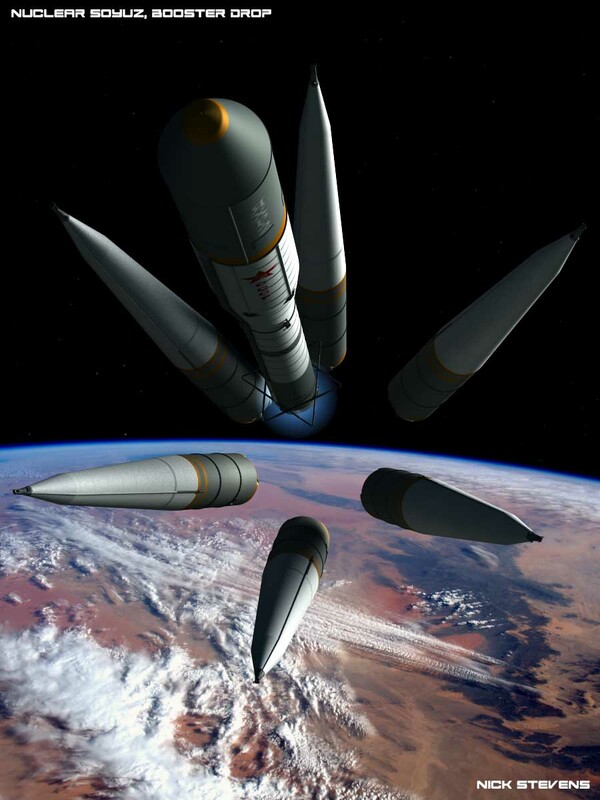 The YAR-I missile with the OKB-456 engine could provide the transfer of a warhead to a range of 14,000 km with an initial weight of 87 tons and a payload weight of 2.6 tons. With the OKB-670 engine a weight of 100 tons and a payload of 4 tons would be acheived. The design of the first stage of the YHR-II rocket was carried out according to the “packet” scheme, of six blocks located around the central block, which was the second stage of the rocket. The external shape of the boosters did not have smoothed edges, to simplify manufacturing. According to the internal design configuration, each booster unit was similar to that of a conventional single-stage rocket with the oxidizer tanks at the front. The internal configuration of the central block of the YakhR-P missile was characterized by the (absence of the body of the tail section?) and the three consecutive chambers of working fluid, with pipes to link them. The engines of all the blocks were started on the ground. The intermediate stage of the NRD, unlike the intermediate stage of the LRE, was characterized by a so-called physical launch, during which the reactor power was increased from 0 to 0.1% without consumption of the working fluid, i.e. Without creating thrust. This was presumably to ensure everything was working, and enable a rapid start at the required time. The full power running of the nuclear engine, (with thrust), began a few seconds before the separation of the boosters. Booster separation was essentially the same as in the R7 rocket, (Soyuz). Test render above, of booster drop. In the design, six support patches were provided for positioning and holding the rocket on the launch tower. The outline design of YHR-II and YaR-I missiles was completed on December 30, 1959. The draft document concluded that the development of the YaR-I missile was inadvisable. On September 9, 1960, there was an addition to the draft design, which took into account new data, covering the possibility of using hydrogen as a working fluid. Can your provide any details on the watt output, Isp, thrust or mass of the nuclear engines? That’s all I have so far. I suspect the info is out there, the study clearly went into some depth. But I’m finding it difficult to search on, mainly because it doesn’t seem to have a distinct unique project name, more a mix of terms around nuclear rocket, so I get a lot of false positives in the search. Next Next post: Into the unknown, at the London Barbican. A review.